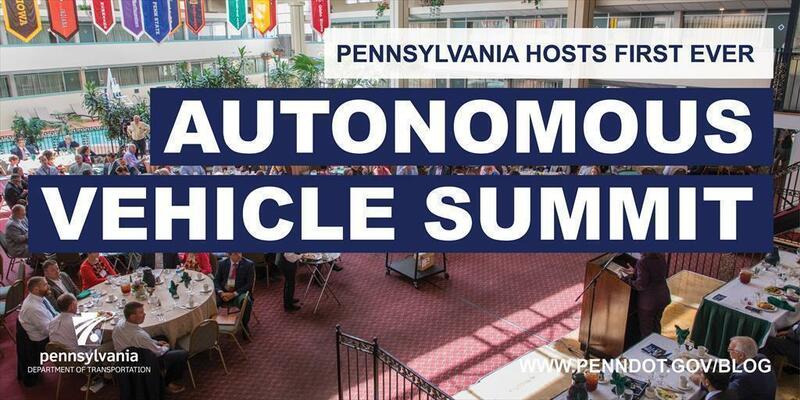 ​Earlier this week, Pennsylvania held its first Automated Vehicle Summit, an event to engage citizens in the planning and oversight of the development and deployment of automated vehicles (AV) in the state. Pennsylvania held its first Automated Vehicle Summit Sept. 11-12, 2017, in State College. Convened by PennDOT and the Department of Community and Economic Development, the conference gathered nearly 300 Pennsylvanians to learn about and react to how vehicle automation will affect local and regional infrastructure planning, workforce development and training, safety, transit, land-use, cybersecurity, first responder procedures, public finances, business models, liability and data ownership (among other topics). Speakers included state and national leaders on these issues and reflected a broad perspective on the benefits and challenges that the era of automated transportation will bring. Headline speakers included Ken Leonard, director of USDOT's Joint Program Office, and Raj Rajkumar of Carnegie Mellon University, one of the world's leading AV authorities. The PA-AV Summit is to our knowledge the nation's first statewide meeting on vehicle automation expressly focused on the dual themes of local and regional infrastructure planning for an automated future and the potential disruptions and opportunities for the workforce. An attendee wears virtual reality goggles at an exhibit hosted by Royal Truck & Equipment Inc. during the Pennsylvania Automated Vehicle Summit. The goals of the summit were: 1) to inform Pennsylvania's citizens and decision-makers about the opportunities and issues automated transportation will present, and to generate feedback to shape PennDOT's AV Strategic Plan; and 2) to establish an ongoing citizen-driven community of interest to actively engage in shaping the testing, development and deployment of AV technology to ensure it promotes stronger communities, shared economic opportunity and improved quality of life. To learn more about autonomous vehicle testing in Pennsylvania, visit www.penndot.gov.